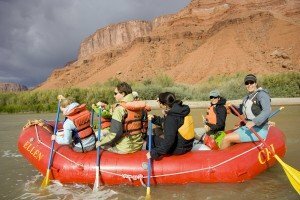 Utah river and land-based canyon country adventures for adults, groups, families, schools, and youth. CFI offers schools and youth groups over three decades of experience in outdoor education. Students experience white water expeditions through ancient canyons, an environmental curriculum at our desert field camp, and many more outdoor learning possibilities! Bring your school or group on a Utah outdoor adventure and journey of discovery that will be remembered a lifetime. CFI offers personalized, custom trips and tours for adults and families. Experience canyon country through science and history through a land or river adventure. Knowledgable guides will show you a great time while pointing out features on the landscape, plants of the region, and historic lore along the way. CFI works with groups of all sizes to create the perfect custom trip. Pick your adventure and let us show you our back yard. April 28th-May 4th, 2019 explore the remote backcountry as we trek down to Rainbow Bridge. Your perfect Utah outdoor adventure and vacation in red rock country. CFI takes you to spectacular, well and lesser traveled destinations for a trip you will never forget. Get to know where we love to go! Take a river trip on the Colorado River, San Juan River, or Green River. Take a tour of Arches National Park and Canyonlands National Park. Learn about the La Sal Mountains, visit national forests and vast public lands. Discover something new in our backyard. Our guides are educated in the geology, desert ecology, history, and the archaeology of this unique place. You can challenge yourself to expand your boundaries and abilities. Find out just how much fun it can be to try something new. Revel in good company and great meals. Enjoy spectacular scenery, silent landscapes, and brilliant night skies. CFI is ready to create your perfect Utah outdoor adventures and vacations in red rock country. The gift of an experience will be remembered for a lifetime.